Space represents such an opportunity for humanity. It is chance for us to work together on something important to all of us. As The United States has largely rejected its space heritage in recent decades, other nations have stepped up in its place. 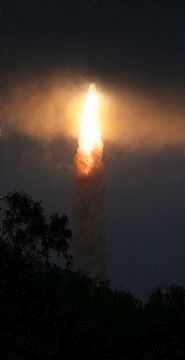 Today India took a major step forward in its space program by launching its first unmanned mission to the Moon. It joins its Asian counterparts Japan and China who already have craft orbiting our nearest celestial neighbor. India’s craft dubbed Chandrayaan-1 – “Mooncraft” in ancient Sanskrit – lifted off today from the Satish Dhawan Space Centre in Sriharikota, India. The launch site is located on India’s southeast coastline near India’s largest city Chennai. For longtime readers of this blog, you know I love space. It is my belief that space exploration poses challenges and offers economic opportunities that could fundamentally alter how humans interact on Earth. It is my firm belief that the global war economy – sadly still far and away Earth’s largest industry – could easily be replaced by a global space economy. In fact, I would argue that economic reasons are the primary driver of wars on our planet. Our planet could be fundamentally improved by the substitution of space exploration for war. Chandrayaan-1’s two-year mission is to provide the most detailed maps ever of Earth’s nearest neighbor and set the stage for landing an unmanned craft on the Moon’s surface by 2012. Last October Japan successfully placed it’s Kaguya moon vehicle in orbit around the moon (view Earthrise and Earthset videos from Kaguya). The Japanese have set a goal of 2025 for placing a manned mission on the surface of the moon. China’s Chang’e vehicle has also been orbiting the Moon for nearly a year now. Russia has announced plans to land on the Moon around 2025 and even NASA has announced plans to return by 2020. This transition to a spacefaring race is a positive step. Just as human beings the world over took pride in the accomplishment of landing humans on the Moon July 20, 1969; everyone can take pride as other nations continue to push the envelope of exploration in our Solar System. So it is in a spirit of common cause, common hopes, and common dreams that I congratulate India on its accomplishment today. May Chandrayaan-1 expand human knowledge about the Moon and bring closer the day when humans work together to travel the stars. That’s one giant step for India and one giant leap for humans in space. The last few days the world has seemed more like the 1980s than 2008. The United States and Russia are at odds and irresponsible threats are flying left and right. Hardline leaders in both countries seem to have forgotten the common interest they have – all of humanity has – in their getting along. Against this backdrop, how much more symbolic of the change we need in our world could Nastia Liukin be? America’s newest female gymnastics gold medalist was born in Moscow and now resides in Parker, Texas. She is a daughter of the Russian motherland and a now proudly represents Team USA. Her father was an Olympic men’s all-around silver medalist for the former Soviet Union at the Seoul Games in 1988. The Liukin family moved to The United States when Nastia was just two years old. Liukin joins Mary Lou Retton (1984) and Carly Patterson (2004) as America’s only female all-around gymnastics champions. Battling fellow-American Shawn Johnson and Yang Yilin of China all night, Liukin was the most consistent in the end. She solidified her top spot with an amazing routine on balance beam and then closed the deal with a pressure-packed and nearly flawless performance on floor exercise. Nastia Liukin took gold in an event that everyone will remember forever. She was poised and dignified in victory. More than that she represents the hopes and dreams of two great nations. These nations should take her lead and pursue their greatness in healthy competiton rather than blustery conflict.